The Walking Dead last night (Sunday, February 10) saw many fans of the FX show confused by new Walker Big Richie. Negan (played by Jeffrey Dean Morgan) returned to the Sanctuary in last night’s episode, which airs in the UK tonight at 9pm on Fox and NOW TV, and saw a zombified Big Richie and seemed to recognise him, leaving fans racking their brains to remember if he had previously appeared in The Walking Dead. FX viewers were left wondering who Big Richie is and who is the actor who plays him. The Walking Dead season 9 recap: Is Rick Grimes ACTUALLY dead? 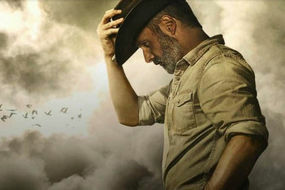 The Walking Dead Rick Grimes films: When will the films be released? Big Richie was a Walker who Negan seemed to recognise when he went back to the Sanctuary in last night’s The Walking Dead season nine, episode nine, titled Adaptation. On seeing Big Richie, Negan remarked on how he was “loyal to the end”. However, he does not appear to have appeared on The Walking Dead before. Although Big Richie and Negan seem to have a relationship of some sort, that didn’t stop Negan from killing his former colleague.